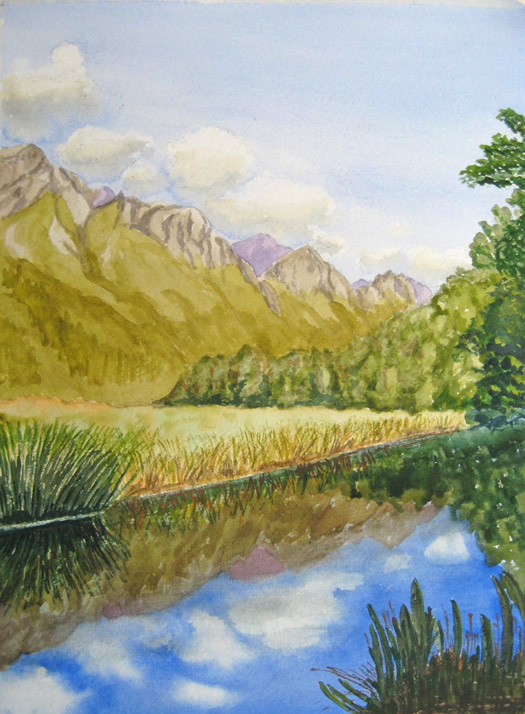 Comments From the Artist: This a a watercolour of Mirror Lake, New Zealand. It is painted in St Petersburg paints on a half sheet of Arches 300 gsm NOT paper. It was painted from my own reference photograph taken on our holiday in January 2008. I like it. I just think the reflection in the water should be a lighter blue like the sky. Hi Mark, awesome job on this painting. I really like the way you captured the reflection of the clouds on the water and how the mountains fade out to the right. Great work. Like the watercolor. Altho water color on lake is beautiful it seems not right for the sky, but then again, I’ve not been to New Zealand otherwise should lighen it up a little. Very peaceful. A very nice painting of a very nice scene. I like the way you’ve worked the colors in throughout the scene. The more I learn the process of painting the more I appreciate the work you’ve done. You do have a wonderful memory of your holiday to New Zealand with this painting. I have also checked out your blog and have seen some very nice work there. Good for you that you are passionate about painting in your retirement. I always say that we as artists are so very lucky. Now for my “nit picking”!!!!! Again, using my “magic squint”, I notice that your painting is divided in half horizontally, and it would have much more drama and excitement if you would give the painting more sky (top section) or more land/water (bottom section). Dividing the painting 50/50 can be boring. So MORE sky with the lovely way you painted those clouds and a little sliver of the water, or MORE land/water with a little sliver of the sky would add more of an impact. I know that this is called Mirror Lake, probably for a reason, because everything reflecting in the lake is like a mirror image. This is when I use the quote by Picasso again: “You have to tell a lie in art in order to tell the truth.” If you paint the water like you see it, it will not look believable. Distort the shapes a bit in the water, blur them, exaggerate what you see to make the water believable to the viewer. I do agree with John that the intensity of the blue in the water is too much. It should be more like the sky. By adding some of the color you have used in the sky to other parts of your painting would help to connect all of the sections together, creating color harmony within your painting. The blue could be added to some of those distant trees and even in some of those mountains. Remember: YOU ARE CREATING A PAINTING not copying a photo! The edge of the bank where the land meets the water could have a variety in edges. Having some broken edges and some lost and found edges would add interest to this area, especially near the left side of the painting. The white line is very prominent because of the dark value in the green grasses and reflections, thus causing us to look at this area. I think that your handling of the watercolor is done quite well. These are only my viewpoints and you are the ARTIST! Happy painting, happy creating, and thank you for sharing with us! Hi – I live in New Zealand and know the area in question. All the scenery in the Queenstown /Milford areas is really spectacular. Skies are really clear and blue (no polution down here) – if anything the sky should be bluer and the Remarkable range of mountains depicted more boldly – otherwise a very pleasant picture. From memory there are lots of reeds and things in the water. Mirror lakes are not much more than pools so there is no movement on the water. Lovely to see pictures of my homeland – maybe I should submit one of mine. I agree with Ingrid in that you have done well. Congratulations on taking your talent into your retirement. I also agree that the vibrancy of the skies colors should be more than the water. I however have enjoyed your painting greatly. I have friends who live in New Zealand and this painting makes me miss them terribly. Love your reflection, it has real depth. We’re a bunch of volunteers and starting a new scheme in our community. Your website provided us with helpful info to paintings on. You’ve performed a formidable task and our entire community will probably be thankful to you.